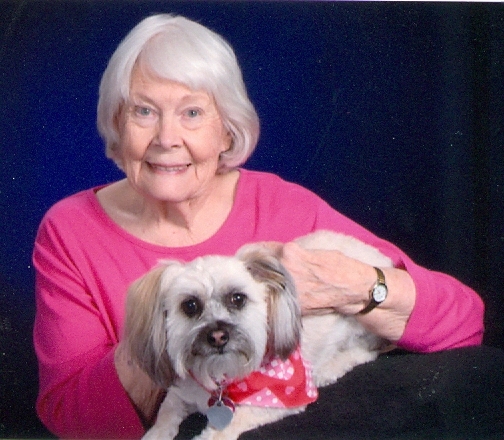 Audrey, often known by her friends as June for many years, died on January 26, 2019 at the Council Grove Assisted Living in Council Grove, Kansas. Audrey was born on October 21, 1925 on a sharecropper’s cotton farm in Memphis, Texas. She moved to Fort Worth when she was 5 years old. Graduating from Paschal High School in 1943, she went to work for the Veteran’s Administration in Dallas, transferring one year later to Washington DC. She often spoke of the memories that she held dear from the time spent there. Audrey moved back to Fort Worth when she married Peter Turkovic on May 23, 1946. Following her husband’s discharge from the Army Air Corps, they moved to Rock Creek, Ohio where they purchased and operated a grocery store. Peter was recalled for military duty during the Korean War and they then moved to upstate New York, followed by many transfers and moves. Audrey loved being the wife of a military man. Suffering from wanderlust and a desire for unknown places, she was able to travel and live at various Air Force bases around the United States as well as overseas at Taiwan. Following her husband’s retirement, they purchased a farm in Orwell, Ohio where she went to work at Welded Tubes in 1966. In the summer of 1969, the family moved to Salina, Kansas. At that time, she went to work for Asbury Hospital, retiring in 2001. In 2004, Audrey moved to Council Grove, Kansas to be closer to her children. Reading was a passion of Audrey’s. She also loved music and it wasn’t unusual to pull up in her driveway to hear rock n ‘roll, country or big band music blaring. She loved to sing and sang in many a church choir as they traveled around the country. Audrey was also very talented with needlework completing many beautiful pieces. Audrey was a member of the First Baptist Church in Salina and later became a faithful catholic, becoming a member of St. Rose of Lima Catholic Church in Council Grove. She was preceded in death by her husband Peter; mother Irene Newland Dixon; brother-in-law George Kleinert; sister-in-law Nita Newland; nephew Rob Kleinert; and former son-in-law John Muller. Audrey is survived by sons John Turkovic, George/Mike Turkovic (Michelle) and Tom Turkovic; daughter Carolyn Culp (Frank); brother John Newland and sister Ann Kleinert; grandchildren Johnny Muller, Audrey Sullivan, Michael Turkovic, Rachael Saluri, Andrew Maiden, Rebecca Turkovic, Ben Turkovic, and Lizzie Buchman; as well as 9 great grandchildren and 3 nephews. A Rosary will be recited on Tuesday, February 5, 2019 at 6:00 PM, with a visitation for family and friends following until 7:30, at St. Rose of Lima Catholic Church. Mass of Christian Burial will be at 10:00 AM, Wednesday, February 6th, also at St. Rose. Burial will follow at Calvary Cemetery. Memorial Contributions may be made to Relay for Life and may be sent in care of Zeiner Funeral Home, PO Box 273, Council Grove, KS 66846.